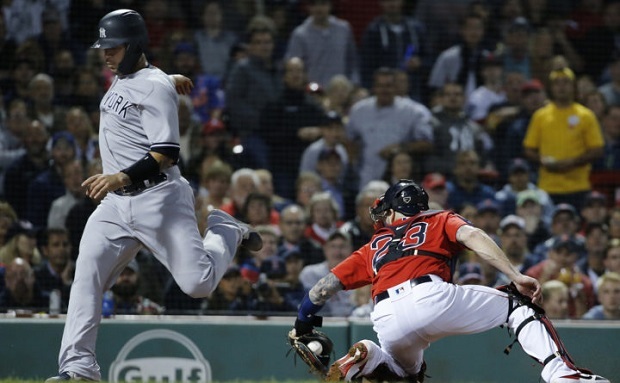 Needing a win to finally wrap up the one lingering question mark for their October run — homefield advantage in the Wild Card game — the Yankees came to Boston and took care of business, demolishing the Red Sox 11-6 in Friday’s series opener. They stuck to their bedrock formula of #toomanyhomers, belting a quartet of longballs — one each in the third, fourth, seventh and eighth innings — en route to the win. It was their MLB-leading 16th game with at least four home runs, and the most ever in a season in franchise history. The only team in MLB history with more four-plus homer games was the Orioles last year (19). Gary Sanchez sparked the dinger parade with a mammoth solo shot in the third that sailed 446 feet over the Green Monster and literally out of the park. Sanchez has a .688 slugging percentage in 77 career at-bats at Fenway Park, the highest mark by any Yankee at the ballpark in franchise history (min. 60 at-bats). Aaron Hicks broke the game open with a three-run blast in the fourth to make it 8-0. It was his 27th homer of the season, giving the Yankees five guys who reached that mark. The only other team in MLB history to have five players go deep at least 27 times in a season was the 1956 Cincinnati Redlegs. J.A. Happ cruised through the first five innings, allowing no runs on one hit, before getting into a mess in the sixth and surrendering a grand slam to the latest Yankees kryptonite, Steve Pearce. Happ was done after six innings, and capped his half-season as a Yankee with a perfect 7-0 record, 2.69 ERA and 63 strikeouts in 11 starts. He is the only pitcher in franchise history to make double-digits starts in a season and finish with at least 60 strikeouts, no losses and a sub-2.70 ERA. 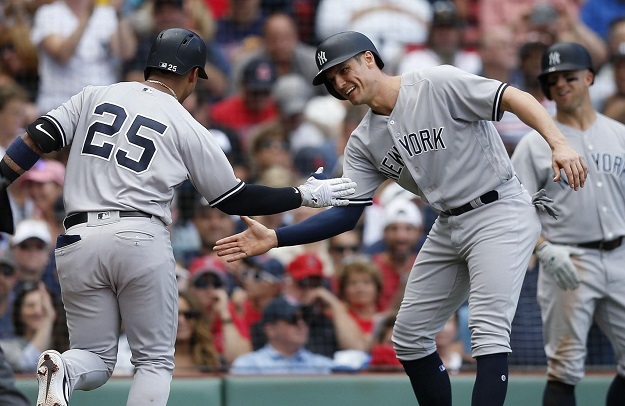 Even with nothing to play for in terms of improving their postseason position, the Yankees still made headlines on Saturday, breaking #toomanyrecords in a 8-5 victory. The win was their 100th of the season — we love round numbers — and the 20th time in Yankees history they’ve reached that milestone. No other franchise has more than 10 100-win seasons. Combined with the Red Sox and Astros also surpassing the century mark, it’s the first time ever that the Yankees and Red Sox have both had 100-win campaigns in the same season, and the first time in major-league history that three teams from the same league posted 100-win seasons. Since baseball went to three-division leagues in 1994, the only other team to win at least 100 games and not win their division was the 2001 A’s, who won 102 games and finished second behind the 116-win Mariners. Gleyber Torres etched the Yankees in the major-league home run record books when he went deep in the fourth inning for the 265th home run of the season, the most ever by a team in a single season. With Torres hitting in the nine-hole, it was the Yankees 20th homer from the bottom of the order, giving them 20 or more homers at every spot in the batting order, another first in MLB history. And here’s another impressive #FunFact for Andujar: He is the second rookie in MLB history with at least 46 doubles and 27 homers in a season. The other? Albert Pujols in 2001. Even before the Yankees and Red Sox took the field in Game No. 162 — a lackluster 10-2 loss — it was a historic matchup. Excluding end-of-season tiebreaker games, this was just the second time in MLB history that two 100-wins teams faced off in the regular season. The other meeting was a Cubs-Pirates series from October 2-4, 1909. If you like round numbers and historical coincidences, this is second time a Yankees teams has finished the regular season with exactly a 100-62 record. It also happened in 1977, en route to their 21st World Series title. The history-making continued in the first inning as Luis Cessa retired only one of the six batters he faced, coughing up four runs on four hits. Meaningless #FunFact alert! He is the first Yankee starter since Andy Hawkins in 1990 to get no more than out while allowing at least four runs in a game against the Red Sox. Hawkins somehow managed to do that twice in 1990, on June 5 and September 1. 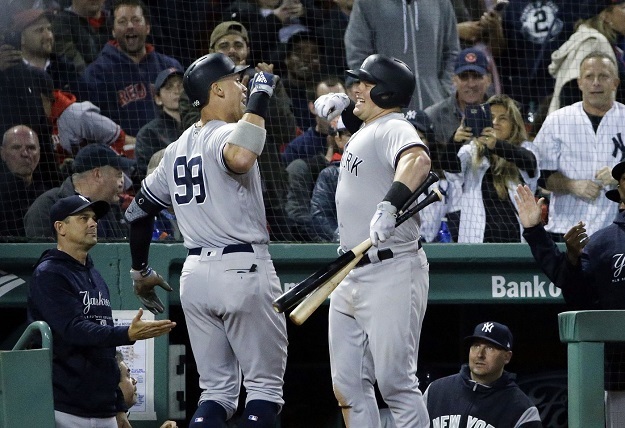 Luke Voit made sure the Yankees wouldn’t be shut out with a two-run blast in the fourth inning. He debuted on August 2 but didn’t start heating up until the final week of August. He first went deep in pinstripes on August 24, and from that day to the end of the season he hit 14 homers and drove in 31 runs for the Yankees. In that five-week span, he hit more home runs and had more RBIs than every MLB player except Brewers outfielder Christian Yelich.